Bruce Scott Fithian made his Carnegie Recital Hall debut singing the song cycles of Michael Viens and has established himself as tenor soloist at Alice Tully Hall with Concert Royal and the New York Baroque Dance Company, the Dallas Bach Society, the Boston Handel and Haydn Society, the Boston Early Music Festival, Mozart’s Idomeneo with Roger Norrington, Jordan Hall, Boston, Bach’s St. Matthew Passion, St. Luke Passion, Handel’s Jephthe, Solomon, Mozart Requiem with Boston Cantata Singers, the Boston Camerata (performances of Roman de Fauvel: Utrecht, Netherlands (Muziekcentrum Vredenburg); Paris (Cité de la musique, Théâtre de la Ville); New York City (Cloisters); Shakers music: Chicago (University of Chicago); Ottawa, Canada (Ford Hall), the Aston Magna concerts at Bard College, New York and Great Barrington, Massachusetts, the Baltimore Art Museum, Purcell and Scarlatti concert, Musica Rara, and the Denton Bach Society, Bach Cantatas. In Europe he sang at the Théâtre National de L’Opéra de Paris: Monteverdi’s Orfeo, Festival de la Chaise-Dieu: Rameau’s Dardanus, Opéra de Nice: Rameau’s Les indes galantes (Valère & Adario) with La Grande Ecurie et la Chambre du Roy, Théâtre National de Châtelet: Rameau’s Les indes galantes, L’Atelier Lyrique de l’Opéra du Nord: world première of Aboulker’s Leçons aux étudiants américains, Théâtre de L’Opéra Comique de Paris: Milhaud’s Les malheurs d’Orphée, Théâtre National de Chaillot: Pergolesi’s San Guglielmo, and Théâtre de la Ville: Purcell’s Dido and Aeneas (sailor). He was featured as soloist with Les Arts Florissants, William Christie, Ensemble Philippe Herreweghe, Ensemble Orchestral de Paris, Lieder Quartett: Brahms’ Liebeslieder and Neue Liebeslieder in Bremen, Radio France, Union Européène de Radio L’Ensemble A Sei Voci: Medieval and Renaissance concert, La Sainte Chapelle, Paris and French and Italian television. His recordings include Music Dear Solace to my Thoughts Francis Pilkington: Songs from the First Booke of Ayres and Lute Solos, Bruce Scott Fithian, tenor; Olav Chris Henriksen, lute. Centaur, Les Motés d’Arras – The Songs of Arras with the New Orleans Musica da Camera, Centaur, Sundown Voyager – Songs Cycles by Michael Viens, MMC Recordings, and with the Boston Camerata: Angel s – Voices from Eternity, Kurt Weill: Johnny Johnson, Sing We Noel – Christmas Music from England & Early America, Elektra/Nonesuch, Pierre Certon: Chansons & Messe “Sus le pon d’avignon”, Harmonia Mundi, Musique Judaeo-Baroque: Works of Salamone Rossi, Louis Saladin & Carlo Grossi HMA, Dido and Aeneas Harmonia Mundi, and Josquin des Prez: Missa Pange Lingua et Motets, Harmonia Mundi. 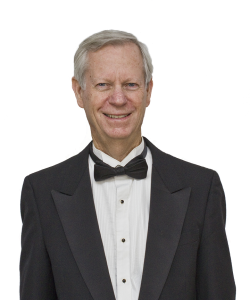 He is a Professor Emeritus of the School of Music, University of Southern Maine and is currently the organist and choirmaster at the Episcopal Church of Saint Mary, Falmouth, Maine.